An estimated 8 million tonnes of plastic is dumped in oceans every year, not only does it impact the ocean, it also has an effect on our health and our wellbeing. A huge number of brands are trying to minimise the impact they have on the oceans, and one of those is Jaguar Land Rover. JLR's ultimate goal is to create zero waste, and last year, in a step towards its ultimate goal, the company announced a range of surfboards made entirely from recycled plastic. In the middle of England's hottest summer, I couldn't take the city heat any more, I slammed my laptop shut, borrowed a Land Rover Discovery, and made way down to the Cornish coast to test them out. We know what you're thinking. Surely Land Rover doesn't use any plastic in its cars! It's all metal, leather and wood? The plastic actually comes from the life-sized clay models that designers create at the very start of the design process. Polyurethane is used as the model's skeleton, and is usually destroyed when finished with. This polyurethane will now be recovered and sliced into blocks, ready for a second life as a surfboard or paddleboard. The surfboards were created in partnership with SkunkWorks Surf Co in Northern Ireland. SkunkWorks is a surf company with a focus on minimising environmental impact, so jumped at the chance when Land Rover approached them. "I’m a keen surfer so being able to create sustainable boards that can ride the waves is great. When Jaguar Land Rover approached us with their idea of reusing polyurethane we couldn’t wait to get started in helping reduce their waste – a subject that is very close to my heart," said Ricky Martin, co-founder of the company. The board was first tested by Lucy Campbell, the English Women's Open Surfing Champion off the coast of Northern Ireland. It is hand-crafted to the exact dimensions (5'7 x 18 3/8 x 2 3/16) required by Campbell, and features carbon fibre rails for additional strength during high-intensity manoeuvres. How did I get on? All I can say is surfing is a lot harder than it looks (and it looks pretty hard). 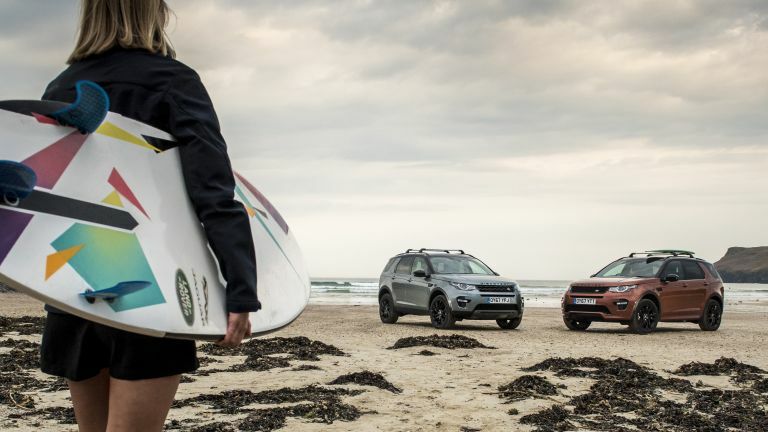 After hopelessly fighting against the waves I quickly decided I prefer being behind the wheel of one of Land Rover's cars than on one of their surfboards. We stayed at the Headland Hotel in Newquay, a large Victorian building overlooking Fistray Beach (one of Cornwall's best surfing spots). You may recognize Headland from Roald Dahl’s The Witches (the film), but since then it's been reinvented as a modern luxury hotel, with large spaces and state-of-the-art facilities. Despite the big investment, the hotel has retained a number of original architectural features, and as a result feels warm and cosy. Surfing lessons and equipment are available at The Surf Sanctuary attached to the hotel. After a tough surf session you can relax in the Headland's spa, with a hydro pool, Swedish sauna, Cornish salt steam room and Elemis treatments. Find the best room rates for the Headland Hotel at Booking.com.